Google Wave is a groundbreaking real-time collaborative tool that has the potential to be an ideal way for members of a group to work with one another. But it’s not clear how useful it will be in the real world. It’s the kind of tool that you want to use, but one that you may not be able to figure out how to fit into your work life. In fact, Google Wave is one of those services that’s nearly impossible to describe to those who haven’t used it. One way to think of it is as a mashup of threaded e-mail conversations and instant messaging — on steroids. Rich content, including Google Maps, interactive polling, videos and more, can be embedded in conversations (called waves). And the rich content is live and interactive. If you embed a Google map, for example, all participants in the conversation can use it as if they were on the Google Maps site. All this makes for a kind of in-depth collaboration that’s not possible with more traditional means of Internet communication. Theoretically, Google Wave can help groups share information, make decisions and take actions more quickly. That’s in theory, though. In practice, it’s not clear what will happen, because traditional e-mail still rules most people’s lives. At this point, Google Wave is still in a relatively tightly controlled, invitation-only beta. Given that it’s free, however, once it becomes public — or if you’re lucky enough to score an invite — it’s worth your while to test it out, if only for the “coolness” factor. 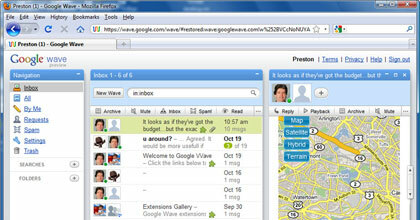 Google Wave’s overall interface resembles a traditional e-mail client. Its window is divided into three panes: contacts and navigation on the left, a browsable list of all of your “waves” in the middle, and the actual wave you’re involved in on the right. The basic Google Wave interface. Those whom you’ve invited to the wave don’t have to be using Google Wave at the time you’re typing the message — they will see the new wave the next time they log in. If they are already logged in when you create the wave, they will get a notice that a new wave has been created, and they will be able to see your message as you type it. Unlike with instant messages, participants see the message being composed live, as it is typed, rather than after the message has been finished and sent. I’m not convinced this is a good thing. Most of us don’t get a sentence completely right the first time — we commit typos, then go back and edit them, or we start with one idea, think better of it, erase it and start over again. With Google Wave, the recipients see that entire process. Watching people type is about as productive and entertaining as watching paint dry. Watching them struggle with typos and editing is even worse. It’s like watching sausage being made — you may like the end result, but the messy process of creation is not one that you want to witness up close and personal. People respond to one another’s messages, as in e-mail, and they can reply either to the entire group or privately to an individual. The thread, with people’s responses appearing in the appropriate places in the conversation, is what makes up a wave. You can format your messages using fonts, colors, highlights and so on, and you can send attachments and links as well. And, as mentioned before, you can embed other kinds of content directly in the wave — by using Google Wave gadgets. If Google Wave ever takes off, the gadgets will be key to its success, because they can potentially integrate Google Wave with other existing services on the Web. For example, there is a voting gadget that lets people vote Yes, No or Maybe. There are also gadgets for conferencing, video-chatting, playing games, getting weather forecasts and more. At this point, though, there aren’t many gadgets available. And finding and installing them is problematic. When you click the gadget icon that appears when you create a message in a wave, all you get is a dialog box asking you to type in a URL. It doesn’t let you browse through a gadget library or preview gadgets. So you’ll have to find each gadget on your own, copy its URL, and then paste it into the box. In the existing Google Wave preview, there is another way to add a gadget — by viewing a Google-supplied wave that has a little more than half a dozen gadgets. But there are more gadgets being created by third-party developers, and for now, there’s no central way to find them the way there is to find, say, add-ons for Firefox. In addition to gadgets, you can also add “robots,” which can participate in waves almost as if they were human participants. You add a robot to your contacts list, and then when you want it to perform an action, you add it as a participant to your wave, in the same way you add a human participant. 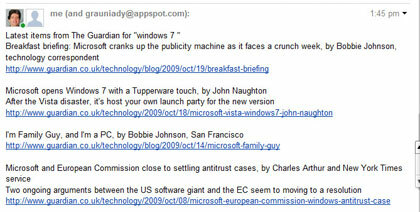 For example, there’s a robot called “Bloggy” that you can use to publish a wave to your Blogger blog. Another robot performs an automatic search of the Guardian newspaper and displays the results it finds, including headlines and links to the articles. To use it, you add grauniady@appspot.com to your contacts, invite it to a wave, and then add the text “Search term ?guardian” to a message in the wave (using the words you want to search for instead of search term), and it will perform the search and display the results. The Guardian robot, displaying its search results. Your waves can be public or private. Only people you’ve invited to a private wave can view it or participate in it, but anyone can view or participate in a public wave. You need to be extremely careful about what waves you make public. And during beta testing, I found a serious security hole — one of my private waves was turned into a public wave without my knowledge. I had added the Bloggy gadget to a wave, but because the gadget didn’t ask for any log-in or blog information, I assumed that the wave was not published as a blog. It wasn’t — but the gadget made the wave public without telling me. I only learned that the wave had been made public when someone I didn’t know joined it and warned me that the wave had gone public. Clearly, this is something that needs to be fixed. If gadgets or robots can make a private wave public without your knowledge, Google Wave will be one of the biggest security holes ever devised. How useful will Google Wave really be at work? Imagine, for example, that a geographically dispersed group in an organization needs to decide when and in what area of what city to meet. The group starts a wave discussing the meeting time, place and agenda. A gadget links to a group calendaring application so that the members of the group can view one another’s schedules and find potential times to meet. People make a variety of suggestions and use a polling application to take a vote deciding on the time of the meeting. Next, people make suggestions for places to meet and include annotated Google maps for each suggestion. The members review one another’s suggested locations, and the polling gadget lets everyone vote on where to meet. In the end, the group can make a decision in a matter of minutes; if the discussion had taken place via e-mail, it could have lasted for days. The biggest drawback to using Google Wave in its current preview version isn’t what’s there, but rather what’s not there — direct communication to the outside world. For a service built for communication, it’s surprising how much of an island Google Wave is — it doesn’t even integrate with Gmail, much less other mail clients and services. There also are no links to social networking sites or instant messaging tools — not even Google Talk. For example, your list of contacts in Google Wave is entirely separate from your list of contacts in Gmail. Worse yet, when you click Manage Contacts in Google Wave, you don’t even get to manage your Google Wave contacts. Instead, you get sent to Google Contacts, a list of your Gmail contacts, which doesn’t include your Google Wave contacts. Eventually, Google will hopefully integrate Google Wave with Google Contacts. But given that Google Contacts is in beta and Google Wave is in preview, it’s not at all clear when or if that will happen. In other words, to be truly useful, Google Wave needs better integration with other services. For example, you should be able to start a wave directly from Gmail with other Gmail users who also use Google Wave. You should also be able to see your Gmail contacts from within Google Wave and send them an e-mail message using Gmail. And you should be able to start Google waves with your contacts on social networking sites. None of these things are currently possible. 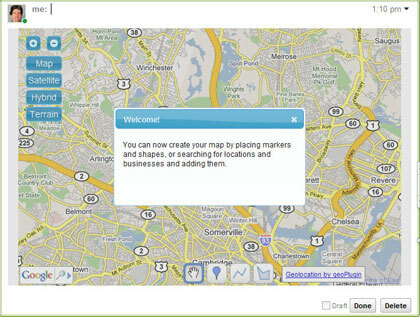 Gadgets can be used to embed content — for example, a Google map. There’s no doubt that Google Wave is an innovative tool for real-time group communication. Spend a little time with it, and you’ll most likely begin to want to use it. But it doesn’t solve the biggest problem with Internet communications — their fractured nature. People use a variety of e-mail systems, a range of social networking sites, different chat clients … the list is a long one. There are too many ways to communicate, and no way to integrate them all. In fact, Google Wave makes the problem worse because it’s adding yet another way for people to communicate without integrating other services. Some observers believe that Google’s eventual goal is to have Wave replace all those services. But no matter how grand Google’s ambitions may be, hundreds of millions of people around the world are not going to desert the way they communicate. Abandoning their current e-mail and social networking tools would be far too disruptive to their work and personal lives. What’s more, Google Wave doesn’t have the kind of social networking features that are built into sites like Facebook, and it’s not designed to replace them. At this point, Wave is only an adjunct to those services, best suited for very specific projects that require live (or close to live) collaboration. If Google figures out a way to integrate Google Wave with e-mail and social networking services, Wave could become a very powerful business tool. For now, though, the integration isn’t there. So if you do ride this version of the Google Wave a few times, it will probably be just for fun. In a world already overrun with online services vying for your attention, it’s not clear that Google Wave will ever become a critical part of your Internet-based communications.